Who needs Mattel when DC is upping their game like this? He defends the world against injustice. He is Bruce Wayne, the original Dark Knight. That bio may seem pointless, but remember: this is Earth-2 Batman; he, Superman, and Wonder Woman were only in the comics briefly before retiring. And while there is still a Batman running around in the Earth 2 comic, that one's not Bruce - we won't be telling you who it is here, because finding out the solution to the mystery is part of the point of the story (although DC did manage to spoil it themselves before the offical reveal). Like Wonder Woman, this costume was designed by Jim Lee, which really sticks a thumb in the eye of everyone who insists all his costume designs look the same. There's armor and there's a collar, but it's not even a little bit similar to the thin armor plates and Roman collars the "real" New 52 characters wear. Why, it's almost like he was just creating a unified aesthetic for the world, like a skilled artist would do! Earth-2 is a much more warlike place than Earth-0 is, so Batman looks a lot more brutal than usual. He's wearing a heavy armored piece that covers the entirety of his shoulders and the upper part of his torso. It's open in the front, but his chest is protected by a large metal bat. There's a gap on the upper arms, then the armor picks back up in the form of gloves that come up all the way over the elbows. There's matching armor on the legs (with cute little bat-ear cutouts over the knees), though he's wearing plain black boots over that. There are ridges on the upper-body armor that look like spikes from the front, adding to his fearsome demeanor. It's like what Ibn al Xu'ffasch would wear if he ever became Batman! The costume he wears underneath all this is grey with a black stripe down the center of the body, kind of like the Earth One Batman. 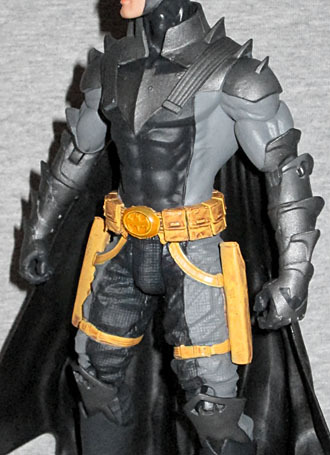 His utility belt is thick and pouchy, and the buckle in the center is a batsymbol in a thick oval. It's bright yellow with a darker wash, and straps hang down off it providing holsters for his two weapons: a matched pair of escrima sticks. 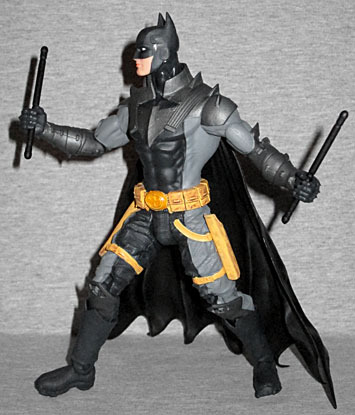 So that he can use his sticks, Earth 2 Batman has lots of articulation! We're talking a balljointed head, swivel/hinge shoulders, swivel biceps, hinged elbows, swivel forearms, T-crotch, swivel thighs, hinged knees, swivel shins, and hinged ankles. No, there's no waist, but let's take a moment to be impressed by everything the figure does have. It would be nice if he had rocker ankles - his feet kind of tip out to the sides, and those would help correct that - but even without them, he moves wonderfully! Batman is never colorful, and this one doesn't break tradition. 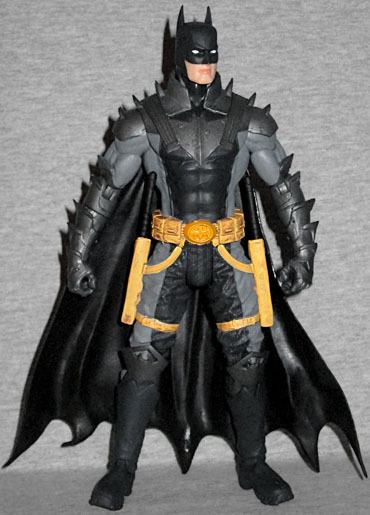 Sure, his belt is bright yellow, but his costume is dark and the armor over it is even darker. You'll want to watch out for slop on the yellow. The face is the same weirdly pale/partially translucent pink a lot of DC Direct toys have had recently. Are they being molded in-color? Even if you're not a fan of the Earth 2 comic, this is still a Batman worth picking up. He's got a good sculpt, plentiful articulation, and a really cool design that isn't duplicated by any other Batmen you may have.